The Commercial Bank of Ceylon has won two more international awards – ‘Best Internet Bank – Sri Lanka’ and ‘Best Green Bank – Sri Lanka,’ continuing a winning streak that has taken its tally of international awards in the first quarter of 2019 alone, to five. 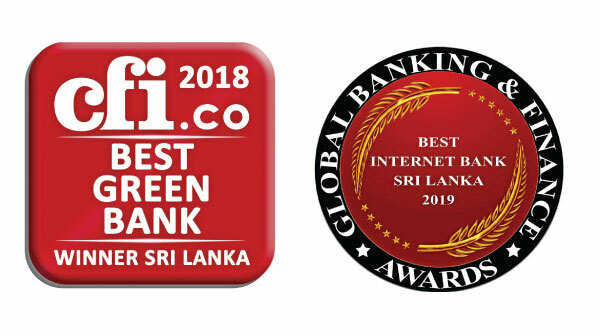 While Global Banking and Finance Review Magazine of the UK adjudged Commercial Bank the Best Internet Bank in Sri Lanka for the fourth successive year, Capital Finance International Magazine, also of the UK, named the Bank the Best Green Bank. Both titles were conferred upon the Bank for its green initiatives and the sustainable practice of promoting paperless banking. The ‘Best Internet Bank’ title recognises Commercial Bank’s status as the owner of the most subscribed to online payment portal in the country. Commercial Bank’s Online Banking platform facilitates customer convenience as well as paper saving through a diverse range of fund management options for both individual and corporate customers. The personal online banking platform offers an exceptional range of features such as fund transfers across a variety of accounts, cross-currency transactions on real time basis, and bill payment facilities to 68 institutions including telephone, electricity, water, credit cards, insurance premiums, education services, sports and recreation and purchase of air tickets. The portal allows customers to apply online for facilities such as personal and housing loans, fixed deposits and investing in treasury bills and also to effect share trading payments. It also offers users the ability to check balances of their current, savings, investment, loan, and credit card accounts, and to transfer funds between own accounts and to registered third parties who have Commercial Bank accounts, on a real-time basis around the clock. The sophisticated corporate online payment platform of Commercial Bank enables corporates to effect virtually all payments ranging from employees’ salaries, statutory payments such as EPF and ETF, commissions, interest and insurance payments, dividend payments, bulk utility payments and duty payments to Sri Lanka Customs. The platform is equipped with sophisticated features to facilitate delegation of authority with single, dual and multilevel authorization and appointment of a company administrator. The ‘Best Green Bank’ title is an acknowledgment of Commercial Bank’s proactive approach to sustainability by integrating social and environmental considerations into all its core business activities and operations placing them at the heart of everything it does. The Bank’s installation of solar power systems at branches, its use of waste management companies that follow international standards in disposal practices for the dispatch of e-waste and paper, initiatives to migrate customers to digital platforms, and investments in automated technology that minimise the use of paper are some of the environment- friendly efforts initiated by the Bank.